Detectives are hunting a man following the discovery of four bodies at a house in Greater Manchester. Police were called to the property in Cheadle Hulme after neighbours raised concerns about the occupants on Sunday. It is believed the bodies - of a woman in her 30s and three children aged five to 11 - may have lain in the house in Turves Road for four weeks. 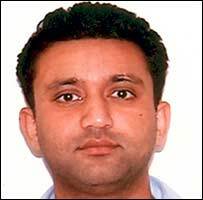 Police want to trace 36-year-old Rahan Arshad - who lived at the property and has not been seen for a month. "We are concerned for his welfare. 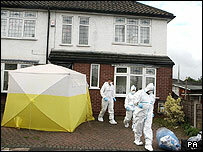 We are treating it as a murder inquiry, therefore we need to speak to him." Officers believe the dead woman and the children - two boys and a girl - are related. Det Supt Bottomley added: "We cannot, at this stage, say how the victims died and formal identification has not yet taken place. "The bodies may have been lying there for up to four weeks and you can imagine in the hot weather we have been faced with a devastating scene." "We have alerted every police force in the country. We want to speak to him in relation to the horrendous events in the house. We are liaising with forces abroad," Det Supt Bottomley said.